He came to truly love the music of the mid-Sixties through the late Seventies (1979 to be precise) chronicling every album and track from The Beatles to ELP, from Jefferson Airplane to Simon & Garfunkel. It was Jefferson Airplane in particular that really skewered him, transfixed him with a sound that embodied the psychedelia of the time with a blues and folk and country that no one else had ever synthesized. So strong was this pull that recently took his vast knowledge and assembled a book. Titled Take Me To A Circus Tent (this is taken from one of the band’s songs), the narrative is truly a defining document of the group’s history. It the most complete and authoritative biography ever written about the band. Here, Craig Fenton talks a little bit about the project, what brought him to it, and why he felt so compelled to write about the band. 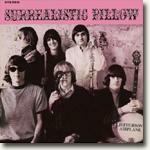 Interviewer Steven Rosen: Can you remember when you first became aware of Jefferson Airplane? Craig Fenton: In 1973, I heard for the first time a non-single from the band called ‘The Ballad Of You & Me & Pooneil’ (from the 1967 release, After Bathing At Baxter’s) on then progressive rock legend station, WNEW-FM 102.7 out of New York City. I was 13 at the time. The power and the energy of the song took me on the first flight and began a lifelong love for the band. And that’s what ultimately drove you to the realization that you had to write about the band? I never understood how a band that was and is of the magnitude of the Airplane, didn’t have books written about them. There was nothing out there with the proper archival information. Previous books looked at the behind-the-scenes aspects pretty well but there wasn’t the definitive documentation of the live and studio work. What was it about the Airplane that so intrigued and moved you? Obviously you’d been listening to hundreds of bands from that era, Janis Joplin and the Grateful Dead and Quicksilver Messenger Service. Why Jefferson Airplane? There were numerous factors. I so greatly respected the fact that the band had four solid singers: Marty (Balin), Grace (Slick), Paul (Kantner), and Jorma (Kaukonen). Previously, they had one of the most underrated vocalists in Signe Anderson. The diversification of the music moved mountains for me. They could play a slow tempo number such as ‘Today’ (Surrealistic Pillow) and you could hear a pin drop. Five minutes later the roof would be rocking from ‘3/5 Of A Mile In 10 Seconds’ (also from Surrealistic Pillow). In fact, that tune made such an impression on me over the years, that I took the title of the book, Take Me To A Circus Tent , from one of the lyrics in the song! TMTACT is truly a marvel of research and facts and chronology. How did you go about researching the book? That must have required months and months of exploration and tracking down information and then piecing everything together. In 1973, I started to write notes about various rock and roll bands; the Airplane was one of those bands. Through 1975 and 1976, I started to collect the unreleased live and studio material from the Airplane. Little by little, I was fortunate enough to come up with the largest collection anywhere. Excluding Marty Balin’s dad, Joe Buchwald. Then, in 1981, I became a radio disc jockey and began to jot down the better questions I would get asked by the listeners. So, how did you actually begin translating this huge amount of material and turning it into a book? The first portion of the book odyssey was to transcribe all those notes I had taken; I had to get them from the paper they were originally written on into a computer, into a Microsoft Word Document. I formulated a game plan but like everything else, that was subject to change. I wanted my book to have something for everyone. I decided there would be a section devoted to live recordings, one devoted to the studio sessions, and even a question and answer chapter. Even though the book was not a graphics-centric book, I still wanted the most extensive photo section possible. There are 93 photos. And I wanted the interview chapter to be the biggest ever devoted to the band. The interviews you conducted here are pretty remarkable. How did you track down the various interviewees? That in itself can be a mind numbing proposition. Luck can go a long way in shaping the direction of a project. I was friends with Rick Martin one of the most respected Jefferson Starship archivists in the world. He is a man of true character. Rick had an unbelievable collection of Airplane music but he had never mentioned to me that he was actually friends with a bunch of the current Jefferson Starship members. One day, out of the blue, he asked if I would consider an interview section for the book? I was certainly all ears! He arranged five interviews for me. Rick then told me to contact Don Aters, the legendary photographer who had been shooting for over 40 years. Don was best friends with promoter legend Chet Helms (Helms was an integral player in the Airplane’s development). Don is a rare individual. He is loyal to his friends forever. Besides being a magician with a camera, Don is also one of the most articulate people ever. Don gave me a bunch of people to call for interviews and I had my own contacts from the radio days. The final piece of the puzzle came from Mike Somavilla. Mike was the person who was instrumental in getting the benefit show for Spencer Dryden (drummer for Jefferson Airplane) off the ground. He is also well-known for his ability to negotiate record contracts for many of the performers from the San Francisco scene. Mike has a company called Crest Of The Wave Productions. I had Mike’s email address and he turned out to be the superlative individual I was told he was. All the thanks in the world go to these friends for what they helped me create! Just for the record, what is your favorite JA album? The album Volunteers is slightly ahead of the rest of their legendary works. Why? The idea to bookend ‘We Can be Together’ and ‘Volunteers’ caught my attention the first time the record got airplay on my turntable. Their version of ‘Good Shepherd’ remains the definitive and one of the most overlooked songs in rock and roll. And ‘Eskimo Blue Day’ is also proudly represented. Was it a difficult book to write? It was unbelievably labor-intensive. It was a very difficult process arranging the 32 interviews and finding all 93 photos. Most of these shots have never appeared in any kind of printed format. Compiling the huge lists of questions and then assembling all the answers took me about a year. Remember, I already had 30 years’ worth of notes already in my possession and it still took a year to put together. During the final six months of the book, I worked – and I use the term loosely because I loved what I was doing – seven days a week, twelve hours a day. I did take one day off! I wanted this to be a fan-friendly book and that was even more taxing than getting the words down on paper. After reading my book, I wanted people to feel like they had the chance to turn the clock back and feel young again. Like they could fly in the Jefferson Airplane Time Machine and experience music like it once was – when a concert was an event in your life. Before there were cellular phones and the horror show we call rock and roll today. For those who never experienced the flight, the book is a chance to see what it was all about. And I really hope that all the amazingly nice people all over the globe will judge from the quality and quantity of the material, why the band should always be kept flying. What is the best line someone told you? It’s always difficult writing a book about something you love – where do you draw the line in revealing stuff about a band? Maybe it would have been better if you’d written a book about a group you hated? Seriously, what did the band think about your book? The feedback has been incredible. I made a promise to the musicians that I wanted to let the music be the star. There was no intention to write a supermarket rag sheet. They liked the fact that I wasn’t out to hurt somebody to sell more books. They had my word that it would never be about drugs, alcohol, or every detail of a failed relationship. These people created a sound for an age and the sound is the music. Where can someone buy the book? If you go to my website www.takemetoacircustent.net, I list several places on-line that are happy to get it to you quickly. The readers can then make their own decisions about where and from whom they’d like to purchase the book. And to everyone, thank you for supporting the book! Are you doing book tours? Signings? The original plans were to do some amazing promotional things with the book. My dad has taken very ill of late and my focus must be on the family. If my dad can get well, there will be plenty of nice events for Take Me To A Circus Tent . Thank you for the opportunity to talk with Curled Up. If I may, I’d like dedicate every moment of the book to my mom, who passed away on December 5, 2003. And to my dad who is fighting to get well. Jefferson Airplane Gets You There on Time & Take Me To A Circus Tent Makes the 40th Anniversary Summer of Love Flight... a Ride for the Ages! CRANBURY, N.J., Feb. 28 /PRNewswire/ -- "Craig Fenton knows so much about the Jefferson Airplane and family, I was asking him the questions," said Marty Balin, founding member of the Jefferson Airplane, commenting on Craig Fenton's new Jefferson Airplane book, Take Me To A Circus Tent . As the plane heads full speed toward the 40th anniversary of the Summer of Love, Take Me To A Circus Tent has opened a portal for those to revisit the original Summer of Love, preceding and subsequent years. Craig says he saw an opportunity to present the Jefferson Airplane in a new direction. The music is the star. The book contains 93 almost-never-in-print photos mostly furnished by Herb Greene (the photographer who shot the cover for the "Surrealistic Pillow" record) and Don Aters (the best friend of legendary promoter Chet Helms). The two rarest are from the early days. One image is pre-Jack Casady and Skip Spence; the other is signed by Paul Kantner as Paul Airplane. The result is a 543-page encyclopedia of information. Take Me To A Circus Tent for the first time accurately describes 121 live Airplane performances (1965-1972), the complete 1989 reunion, and the final flight to the Rock Hall of Fame (1996). Aboard the plane is a detailed look at 60 unreleased songs, demos, and rehearsals, your captain presents 266 questions and answers regarding the Airplane and spin-off bands, and proffers the largest interview (not quotes) segment of an American rock and roll book the mind could recall with 32! Craig Fenton has been archiving Jefferson Airplane music for the past 31 years. He possesses the largest collection of Jefferson Airplane rarities with the exception of Marty Balin's dad. Craig is a former radio personality for 10 years and is an expert in 1960s and 1970s rock and roll. For a seat on the ultimate Airplane ride visit Craig's website at www.takemetoacircustent.net. 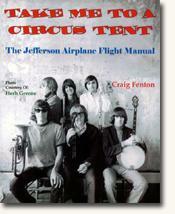 Contributing reviewer and esteemed music journalist Steven Rosen interviewed Craig Fenton, author of Take Me to a Circus Tent: The Jefferson Airplane Flight Manual (see accompanying review), about his book for curledup.com. Steven Rosen/2007.